For Christmas, my company gave everyone a Honey Baked Ham. This made me SO happy! I absolutely love Honey Baked Ham! We usually eat the ham all week, so I am always looking for new ways to prepare it. This year I came up with these Chicken Cordon Bleu Roll Ups. They were delicious! 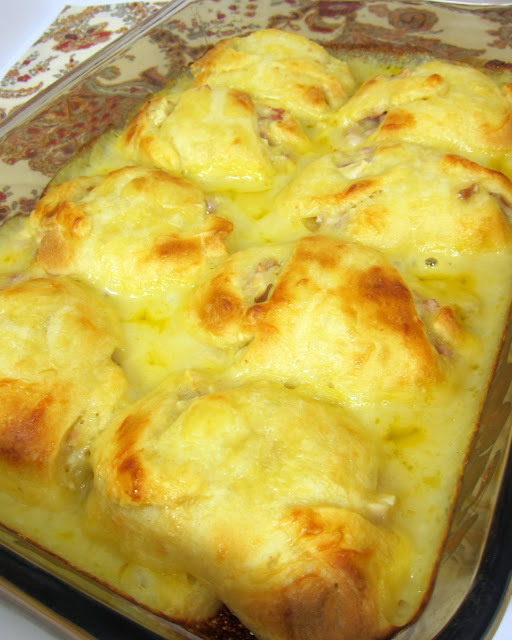 It had all the flavors of Chicken Cordon Bleu, but it was much easier to make. We both agreed this dish is going in the regular dinner rotation. Spray a 9x13-inch pan with cooking spray; set aside. Mix together milk, soup and cheese - set aside. Combine chicken and ham in small bowl. Add a few tablespoons of the soup mixture to the chopped meat - just enough to bind it together. Separate crescent rolls into 8 triangles. Top the large part of the crescent triangle with the chopped chicken and ham. Roll crescent rolls up. Spread approximately 1/3 cup of soup mixture in bottom of 9x13 dish. Place crescent rolls in dish. Pour remaining soup mixture over crescent rolls. Good,good.Hallo.I have visited your interesting blog.Do You want visit the my blog for an exchange visit?Grazie. A really good looking dish Steph and your sides look very good as well. I'd sure like that plate of food placed in front of me. I'm back. Been off since the 21st. Am catching up. Looks very good. I have some chicken that I need to use!!!! I made these 2 nights ago. Super easy and my family husband and step-daughter approved. I actually made it as a stand-alone dish... no side dishes at all. They didn't seem to mind. It was really, really good.